“This Is Cinerama” Returns To The Cinerama Dome! 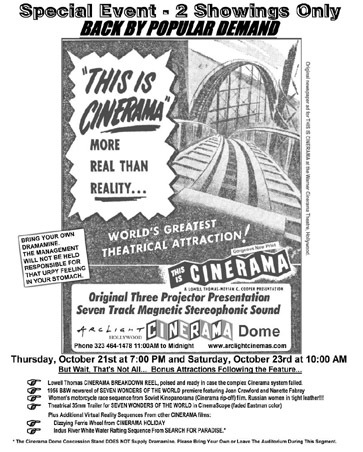 “‘This Is Cinerama’ The film that began widescreen in 1952 returns to the Cinerama Dome for two performances only. The film will be shown in its original 3-projector 7-channel surround sound format on the Dome’s giant full 90 foot wide curved screen. Showing Thursday evening October 21st at 7:00 PM and again on Saturday Morning October 23rd at 10:00 AM. ‘Lowell Thomas breakdown reel’ — This is the standard format reel originally shown in the 1950s whenever the Cinerama system broke down. Lowell tries to entertains Cinerama audiences on the small screen with some unusual stories and bad jokes. ‘1956 B&W theatrical newsreel, Opening of Seven Wonders of the World’ Coverage on Broadway of the opening of the 3rd Cinerama Film. Features Nanette Fabray and Joan Crawford. Theatrical 35mm Trailer for ‘Seven Wonders of the World’ in Cinemascope (color has faded). Women’s motorcycle race action scene from ‘Naughty Curves’ or ‘Opasniye Povoroty’ showing in full 3 projector Kinopanorama with Russian Dialogue. Kinopanorama was the Russian version of Cinerama and the two formats were compatible. Dizzying Ferris wheel sequence from ‘Cinerama Holiday’ in 3 projector Cinerama to be followed by the Cinerama white water rafting on the Indus sequence from ‘Search For Paradise.’ Note: For those who are prone to sea sickness the theater recommends you not be present for this Cinerama white water sequence. ‘Cinerama Adventure’ The 35mm feature documentary on how widescreen and stereo sound came to the movies will screen at the Silverlake Film Festival Sat. Sept. 25th at 10:45 AM and then again on Wed. eve. Sept. 29th at 7:45 PM at Arclight Cinemas. Silverlake festival ticket information: 323-993-7225. I suggest anyone to go, do not miss out. I wish it was in Detroit, very very unlikely. I’d like to go, too, but CA is on the other coast and don’t have the funds, but do have the frequent flier mileage to go ;) Hmmm. The last time I was in H'wood, they were just remodeling the Dome. It would be nice to visit the refurbished theater and other palaces there. I wish our (Wash DC) Uptown theater would have events like this. They used to have Cinerama projection capabilities and the curved screen to do it. It should be in NY. The Broadway Theater where This Is Cinerama had its world premiere is still standing. Now if it would only stop presenting those god awful musicals which it seems dedicated to. Well, gentlemen, I wish that it were being screened in either Sydney or Melbourne, so that I could have a ‘perve’ at the 12-minutes of “Opasniye Povoroty”, which Bruno and I spend tonnes of money restoring back in 1997. Kinopanorama lives at the Dome, thanks to Dave Strohmaier and John Sittig of Pacific Theatres/Cinerama Inc. Too bad that the wankers at the Seattle Cinerama have no interest in screening any 3-strip films, save once a year — at best.